The Denmark green card process also requires that the applicant after he or she becomes a green card holder has enough funds to support himself/herself. This funds requirement also holds for any other family member accompanying the applicant for Immigration to Denmark. How to calculate Denmark green card points? 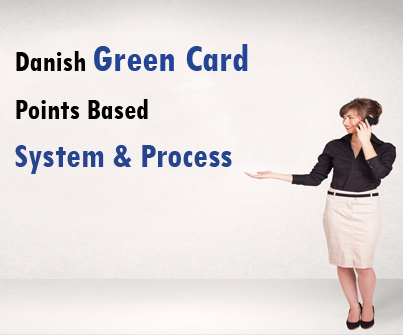 The Danish green card process for immigration to Denmark as already indicated and elaborated upon above is a points-based one. Thus as pointed out above, there are points for educational accomplishments, language skills, work experience, adaptability and age. To be able to obtain points for the applicant’s educational credentials, he or she has to have at a minimum, the equivalent of a Danish Bachelor’s degree (30 points). And additionally, the higher academic degree, the more the points that are awarded. Thus, a two-year Master’s degree will fetch the applicant 60 points, etc. An applicant also receives points for proficiency/ability in a set of chosen/specified languages. Thus, the language skills assessment and points based on that are related to the level of attainment in that language (a set of specified languages). A maximum of 30 points can be awarded for language skills. The languages which are taken into consideration are: Danish, or, English, or German, Swedish, or Norwegian. Also, an applicant can receive points for two languages in all one Scandinavian language and for either English or German. Points are also given for work experience and depending upon how many years in the last 5 years the applicant has worked. And also, the requirement for the Danish green card process is that the applicant should have worked as a researcher or in a field the country has a shortage of suitable workers. A maximum of 15 points can be awarded for work experience. The requirement or points awarded to the ‘adaptability’ factor are that these relate to the applicant’s past educational or work related attainment or experience in the EU/EEA. The maximum points that can be awarded to this factor are 15. And, as for age, at the time of submitting the application, the younger the applicant is, the more points he/she receives. Thus, the points that are awarded for someone between 35-40 years are 10 and the points awarded for someone who is 34 years or less than that many years, is 15. Thus work experience, adaptability and age are some of the key criteria in going through the Danish green card process and becoming successful in immigrating to Denmark.